We are preparing “things” for everyone for all the classes and clubs this month! We are excited to get classes started again! 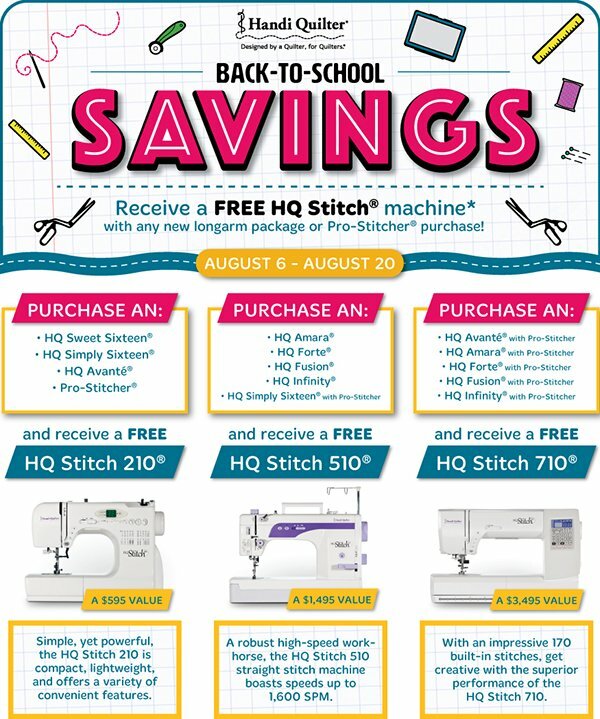 Check out these savings from Handi-Quilter! Come in and talk to Darrell! You can’t beat these savings! Next week is our Handi-Quilter Classes with Diane Henry. Come to Preview night Wednesday, August 15th from 6-8 p.m. and see what you can do with these awesome machines! Do you own an ACCUQUILT GO! CUTTER? We are forming an Accuquilt GO! Cutter Class in September. We will be teaching how to use the dies and the Qubes, etc. We will be teaching you how to use your cutter to make hundreds of designs. We will do a different pattern each month! Jelly Rolls, Jelly Rolls, Jelly Rolls!! Come and join us on September 8th for Jelly Roll Day. We will be sewing from 9 to 3! There will be lots of fun, games, prizes, and snacks! The cost is $5.00 and you can register any time you are in the shop. We are limited on space so don’t be left out! We are still receiving Christmas and Holiday Fabrics!! We have lots of panels too. So be sure to check this out. Sharynn’s Stitching Friends meets Saturday, August 11th at 9 a.m. here in the shop. Bring your Show ‘n’ Tell for everyone to see. And be sure to sign up for the Jelly Roll Sew In! !